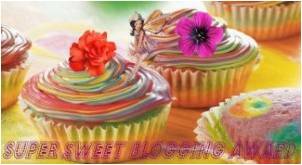 My thanks go out to Sarah Jade McDermott for nominating me for the Super Sweet Blogging Award. I love her blog – its full to the brim with information on essential oils, amongst a plethora of other information. It is definitely worth a visit! Rules: give credit to the person who nominated you, answer questions from the Super Sweet Blogging Award, and nominate a “baker’s dozen” of 13 blogs that you admire. 2. Chocolate or Vanilla? Definitely vanilla! 3. What is your favorite sweet treat? I couldn’t possibly name only the one. 4. When do you crave sweet things the most? When I know I shouldn’t have them! If you have recently been nominated for the same award, I do apologise. It’s hard to keep up with nominations these days :-). I also apologise if you don’t do awards. I just wanted to show my appreciation for your blog. This entry was posted in On My Travels and tagged award, awards, Super Sweet Blogging Award. Bookmark the permalink. I did remember to thank you profusely for what I started calling “the psychedelic cupcake faerie award,” n’est-ce pas? I see I pinged you back, but that’s never as heartfelt now is it? Psychedelic cupcake faerie award…I like that! hi, i wanted to tell you that i have nominated you for the beautiful blogger award! i know you have one already but i really wanted to nominate you 🙂 my post will be up soon. Thank you so much for the award! It is a great honor to be recognized as such a new blog! THANK YOU very much for the award and I am even number one on your list. Awesome!